Experience an ultimate vacation by the beach and a safari adventure in Kenya. Spend a relaxing and leisure moment at Diani Beach Hotel and enjoy a safari tour in Tsavo East National Park. In this tour, you will surely witness that there are lots of wonderful sites and exciting activities that Kenya has to offer. Discover your next great adventure now! Policy for children: Children from the age of 3 years are allowed to participate under the supervision of a parent or guardian. 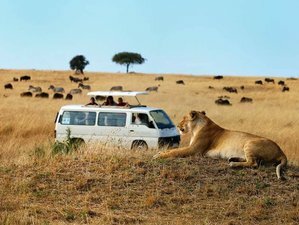 During this safari, you will be staying at Leopard Beach Resort and Voi Wildlife Lodge. Leopard Beach Resort and Spa has a reputation for excellence. As well as enjoying the prime position on Diani Beach on Kenya’s South Coast, the resort has extensively upgraded accommodation and facilities making it the preferred destination for holidaymakers and business travelers alike. Accommodation comprises standard and superior rooms, suites, cottages, and luxurious private villas. For this tour, only accommodation in a standard room is included but if you want to upgrade to a superior room, there will be an additional 15 EUR per person per night. All rooms are air-conditioned and offer the full range of quality amenities including Wi-Fi in cottages, suites, and villas. The resort offers a diverse range of wining and dining options including a Chaine des Rotisseurs grill room, a stir-fry beach restaurant, a fresh pizza and pasta restaurant, a nyama choma (Kenyan barbecue) restaurant, and a pool bistro. The resort also boasts several bars including Marco’s al-fresco bar where a wonderful selection of cocktails can be enjoyed whilst overlooking the pool and ocean below. Nestled in the heart of elephant country, Voi Wildlife Lodge is located in the savanna grasslands of Tsavo East, Kenya, just five kilometers off the main highway connecting the Capital Nairobi to Mombasa. Accommodating up to 300 guests, all rooms have spacious en-suite bathrooms and are furnished in African decor that is replicated throughout the lodge. The luxury rooms comprise two four-poster beds and views of the savanna, which one can enjoy from the comfort of one’s balcony or terrace. Upon arrival, you will be met and transferred to Leopard Beach Resort along the beach of Diani. You will check in in a standard garden room and you will be served with breakfast and dinner. You will spend a full day at leisure in Leopard Beach Resort and you will be served with breakfast and dinner. You will check out from your hotel room. After an early breakfast, you will be picked up from your beach hotel and depart to Tsavo East National Park (12,000 square kilometers). Upon entering the park, the driver will open the roof of your bus so you can stand up with the wind in your hair. Your safari adventure has now begun! Tsavo is the largest national park in Kenya and is split into east and west by the highway. You will arrive at your lodge in time for lunch and later enjoy time for relaxation before setting off back into the park for your afternoon game drive. You will return to your lodge as the sun sets. You will stay overnight at Voi Wildlife Lodge, and you will be served with breakfast, lunch, and dinner. You will have an early morning game drive in the park followed by breakfast at the lodge. Then, you will drive back to beach hotel arriving late in the afternoon. You will check in at Leopard Beach Resort in a standard garden room and you will be served with breakfast and dinner. You will check out at 10:00 a.m. then you will transfer to Moi International Airport (MBA) in Mombasa for your return flight which will be booked by you. And that is the end of your safari adventure. Diani Beach is perhaps the best beach in Kenya. It is wide, silvery, palm shaded, and reef fringed, with some sandbars in the lagoon that are exposed at low tide for excursions from the hotels in dugouts or glass-bottomed boats. There is a good balance of places to stay, places to eat, sea and land-based activities, and various spots to drink and party a little. It is more than 13,700 square kilometers and is most famous for its huge herds of dust-red elephants that more than 10,000 of them bulldoze the way around the vast park. Tsavo East is mostly a vast flat plain of sandy soil, split by the shallow trough of the Galana River. The plant communities of Tsavo East are dominated by short grasses, thorn bushes, and two major species of tree. The baobab is the iconic tree of Tsavo West National Park, across the Mombasa highway, but you still find significant numbers of these compelling trees, with their enormous trunks and stumpy branches. They form important habitats for many species of birds and insects, you will often see hornbills using holes in baobabs to nest in. On wildlife densities, short-maned Tsavo lions and cheetahs appear often. All the plains grazers and bush browsers are much in evidence and elephants with big tusks are many, surging across the river, wallow in the waterholes, and file over the red earth roads in front of bulging baobab trees. Despite being in southeast Kenya, Tsavo East is zoologically associated with northern Kenya, meaning you will see long-necked gerenuk and Somali ostrich, the male of which has a blue neck and legs, and introduced herds of the handsome, fine-striped, Grevy’s zebra. There is also a breeding population of black rhinos, closely monitored by rangers who track them through the bush, though very few travelers on Tsavo East safaris are lucky enough to see them. Daily meals are included as per itinerary. Different dishes will be available in buffet-style. An additional 15 EUR per person per day is required for a full-board meal supplement at Leopard Beach. Aside from food, you will also be given one liter of bottled mineral water per person per day. In this safari trip, you will be able to relax at the beach, enjoy swimming, sign up for a spa treatment in the resort, or shopping. You can also experience a Wasini Island excursion and Mombasa city tour. Please book your flight to arrive at Moi International Airport (MBA). Transfer from and to the airport is included. Ultimate Africa Expeditions will pick you up from the airport. The hotel is 45 minutes' drive from the airport and 20 minutes of ferry crossing. Airport: Moi International Airport Airport transfer included: Moi International Airport No additional charges. You can request this in the next step. The rest of the payment should be paid 15 days before arrival. Ultimate Africa Expeditions specializes in safaris, beach holidays, and treks from middle to top luxury range within East Africa region. This vacation is available all year round, except on December 22, 2017 to January 5, 2018. Children 3-11 years old sharing with 2 adults are charged 50% of the adult rate. Children 3-11 years old sharing in their own room are charged 75% of the adult rate.